Let's just get straight into it. 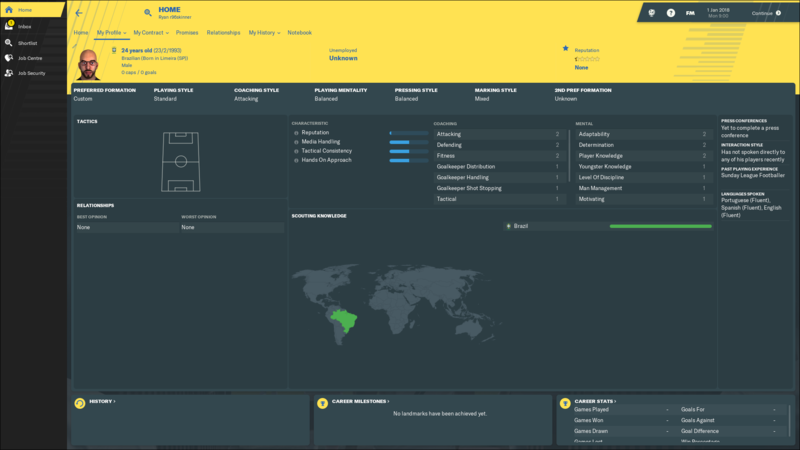 I've added all the default North and South American leagues, which can be seen below. 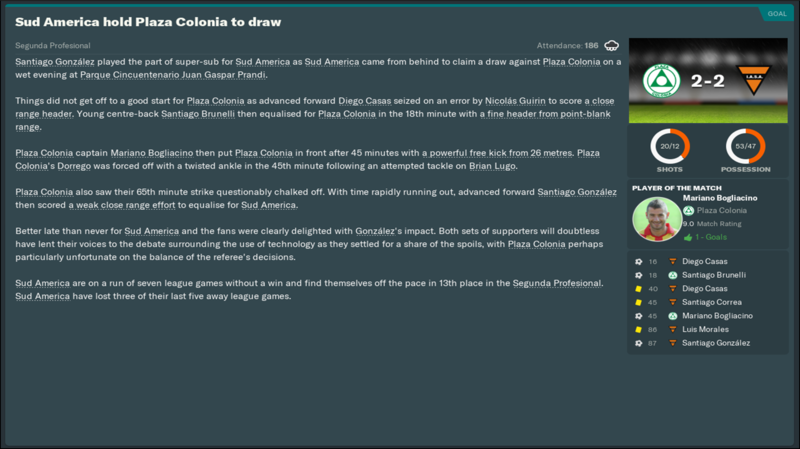 My initial aim was to start somewhere in South America, preferably in a lower division. 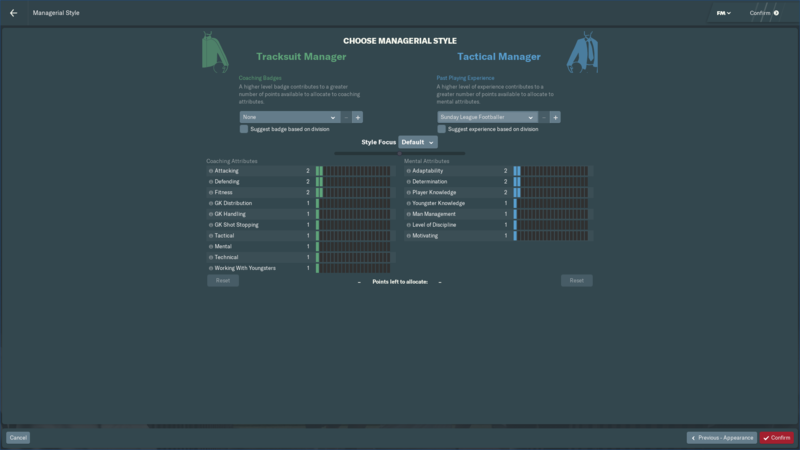 You can see the screenshot for the leagues loaded/save set-up below, along with my manager's profile and the managerial style; which is the lowest possible. The job search was the exact opposite of action packed, but it did go on for a long while. 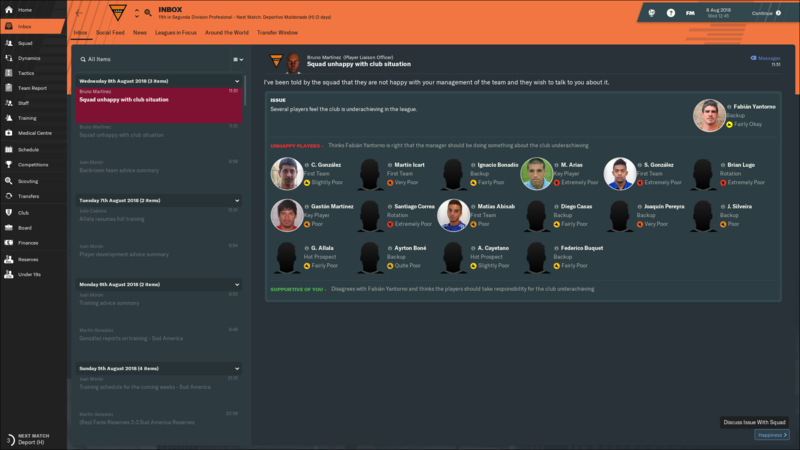 I started the save on 1 January 2018 but, despite constantly applying, I didn't get a job interview until 5 May 2018. 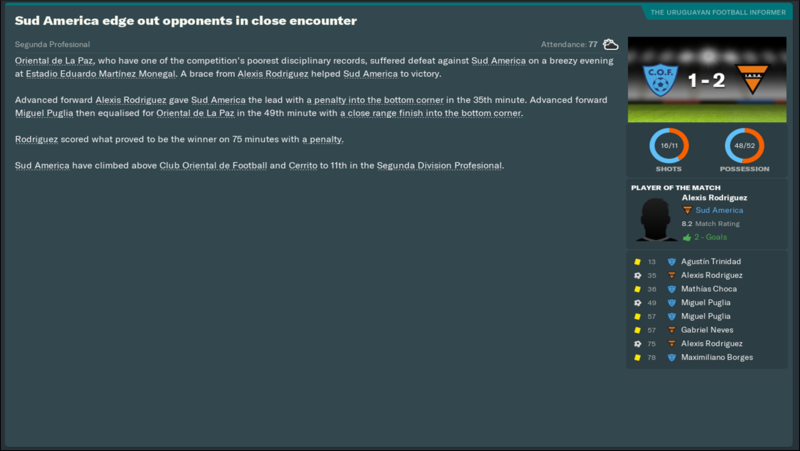 That came from Uruguay's Sud América, of the Segunda División. I was happy, exactly the sort of level I wanted to begin with. A job offer followed. Which, after months of waiting, I was never going to turn down! 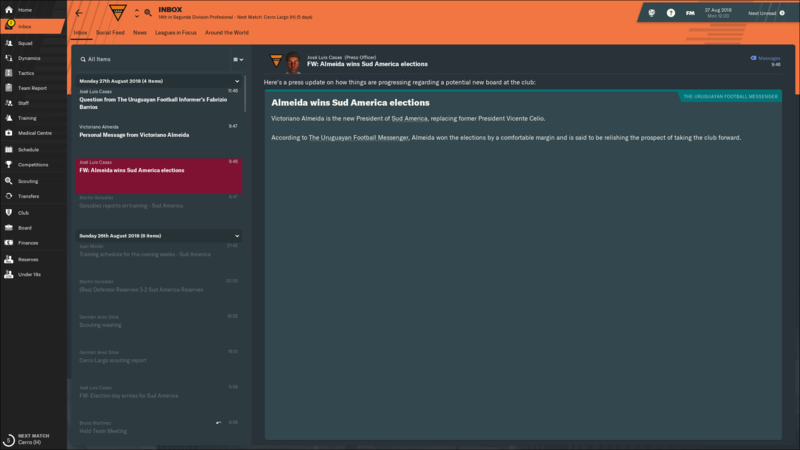 I'm the new manager of Sud América! No prizes for guessing which continent they're from. 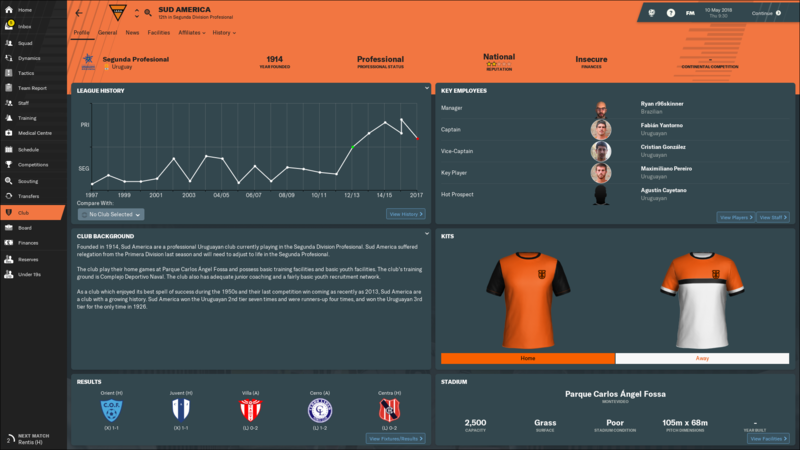 I join the second tier team midway through the 2018 Uruguayan Segunda División season, with the club sat 12th (third bottom) after thirteen fixtures; exactly thirteen games left to play. 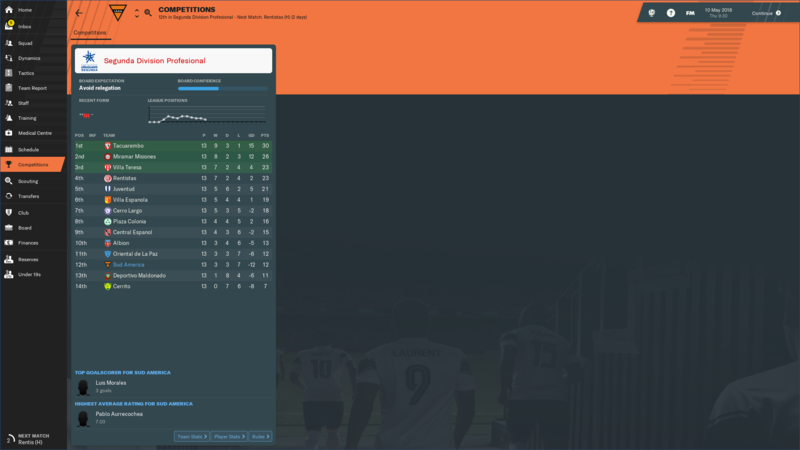 Relegation is our main threat, which is decided by an average points table in our league. 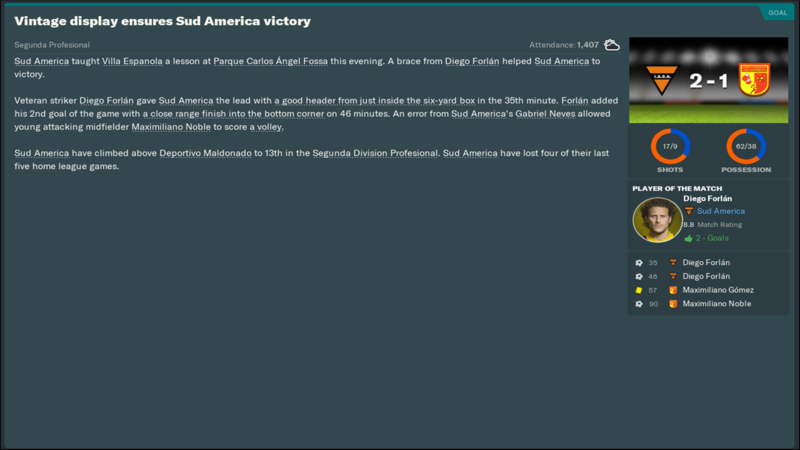 In that, things look bleaker, Sud América are bottom of the table. So points are of the essence. We play three of the top four in my first four fixtures, talk about a baptism of fire! 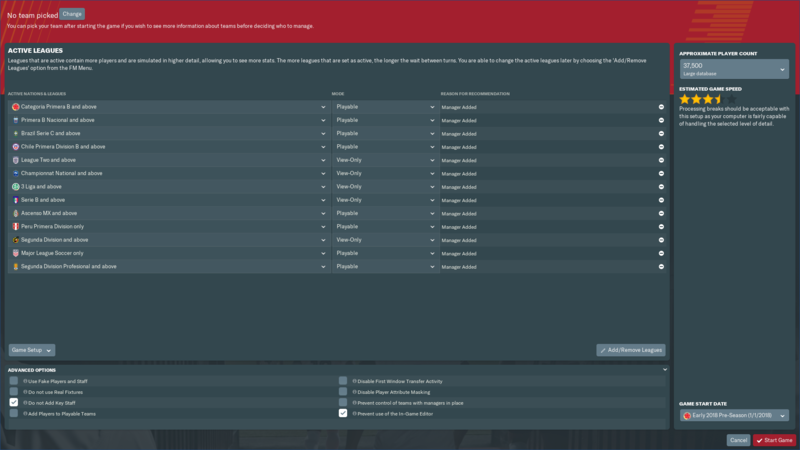 Below you can see our current situation, along with the squad list. 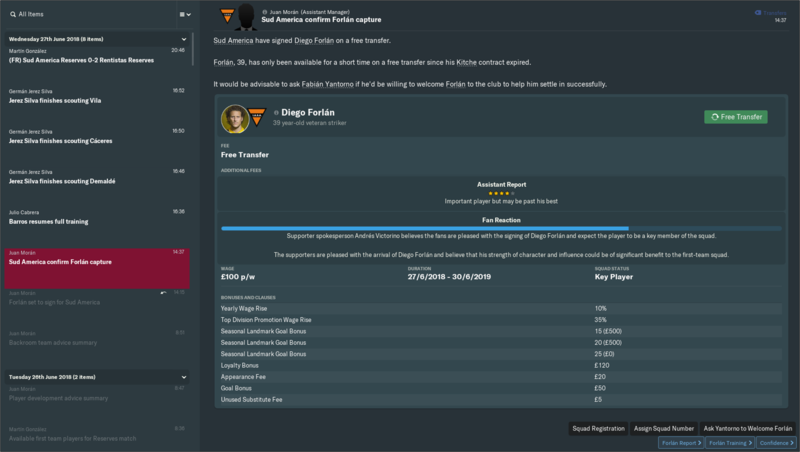 I have no idea how this is going to go, at Sud América or in the save overall. That's all part of the fun, I haven't got any aims whatsoever - what will be, will be (we're not going to Wembley). Such an aptly club to start your South American travels at. 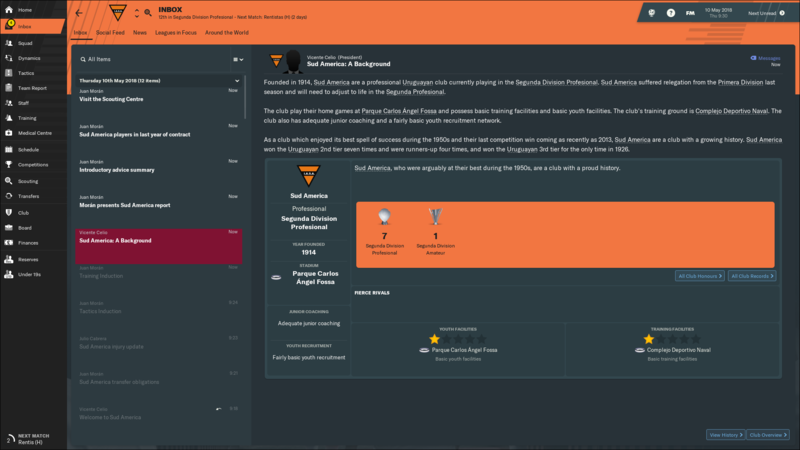 I love me a Journeyman save! Definitely making me want to start one now! Good luck! Ahh yeah Journey man's journey was an epic read mate!! Glad to see this back up and running. The average points system is a bit of a head trip at first but easy to understand once you figure it out. Hopefully the start of this journey doesn't end in relegation for you. Am sure you can keep this side up. Indeed! Thanks. If you can, do it - can never have too many Journeymans! Thanks and let's hope so! It makes it seem more complicated that it actually is, the same thing is needed like in any other league - points! So, it begins. 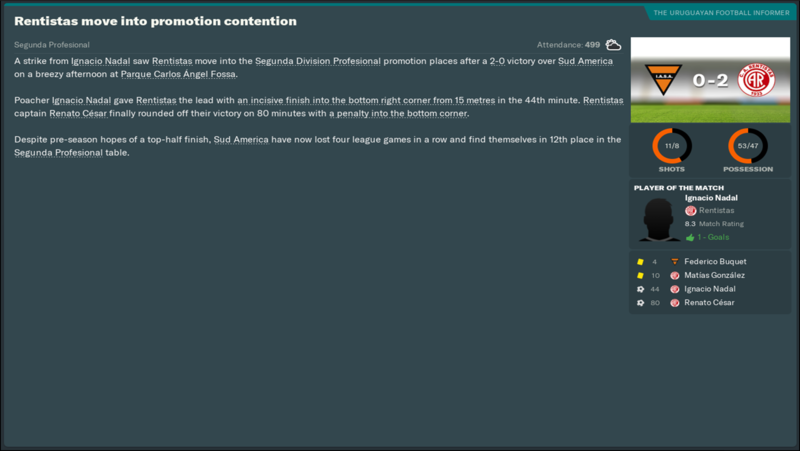 My first month in charge of Uruguayan club Sud América has concluded. Five matches completed, as I joined the club third bottom of the regular Segunda División season table as well as last in the crucial relegation average points table. Points were very much needed, but we faced three of the top four in May so it wasn't going to be easy. Here's what happened. Thoughts: Good opening performance, despite suffering defeat. 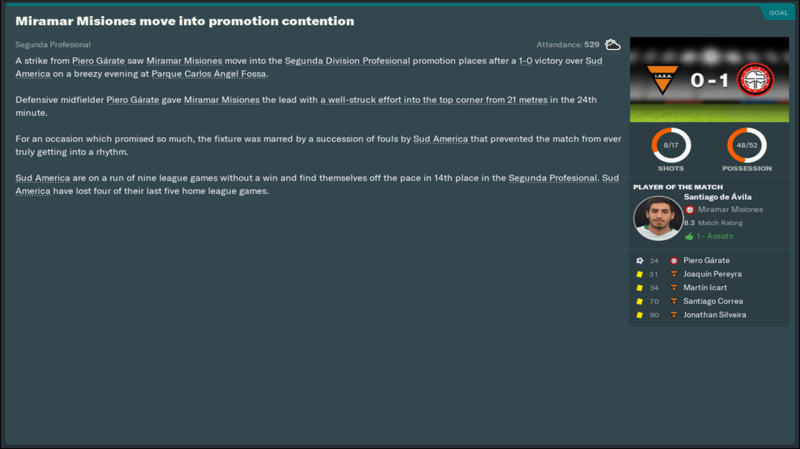 Promotion-chasing Rentistas may have got the three points, but we deserved more - much the better team. Thoughts: Another positive performance, even though our hosts played the best. This time we were rewarded for our efforts, a point added to the board. Small steps. Thoughts: Again, I was pleased with what we did. As you can see from the stats, we gave the runaway league leaders a very good test. Their higher quality got them the victory. 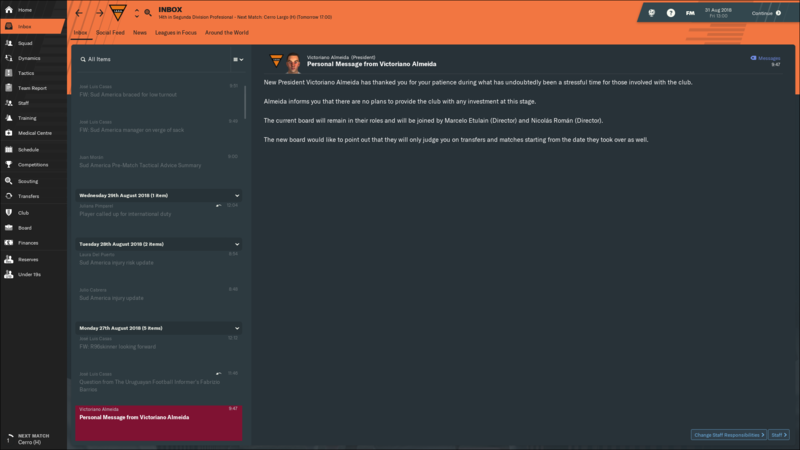 Thoughts: Probably the worst match of my tenure thus far, no complaints with that result - if anything, I was content as, despite being poor, we only lost by one to a high-flying club. 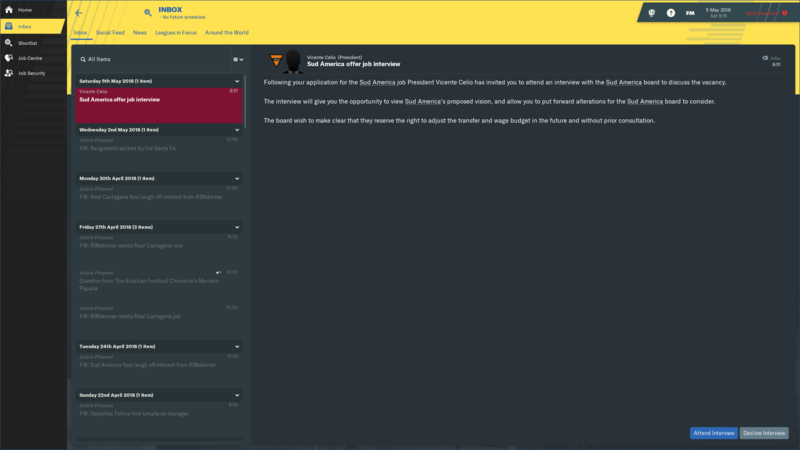 Thoughts: There we go, a first win in charge! It was coming, our overall performances had merited it. It was a match that, despite the scoreline, was never in doubt. We were 0-4 up at one point, prior to FM's usual addition of drama. Sensational performance, just a shame it ended like it did. However, buzzing with the three points. Recap: So, May ends in the best possible way. That fixture with Albion was the one we had to get points from, the previous fixtures were always going to be tough given the opposition. Overall, I'm enjoying these first few months of the save. 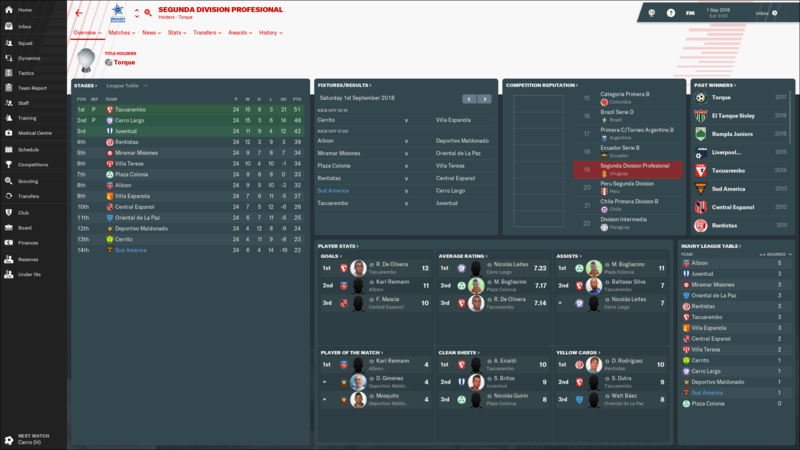 Relegation is still looming, but if we play like that every week for the final eight Segunda División matches then I have a good feeling about surviving. All this means absolutely nothing if we don't continue into the next few months, where we have some massive fixtures: Cerrito (A), Villa Española (H), Oriental (A), Deportivo Maldonado (H). Villa Española aside, they are all of the clubs surrounding us in the standings. Make-or-break few months! Still in contention to stay in the league. You've gor this! Some good performances in there despite the scorelines @r96Skinner! I'm sure you'll be able to crack on, good luck! 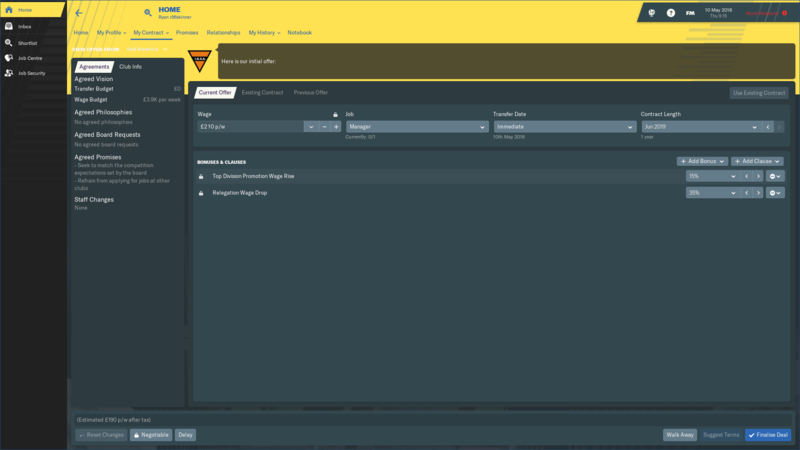 3 careers into FM19 on here already @r96Skinner slow down a bit fella. Feels like its coming, its now or never with our next few fixtures. Squeaky bum time, as Sir Alex would say! I've been pleased with the performances, players doing well but just might not have the quality needed. 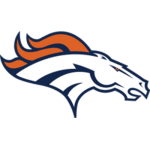 Big games coming! Blame Guangzhou Evergrande! I usually stick to one save for an entire game year, but that usually ends with me getting bored by January/February. Having fun mixing it up with Orlando Pirates and this. It doesn't, but I'm optimistic after that last performance against a team we had to beat. More performances like that are needed over the next few months. I'm sure there are better performances to come, hopefully the team can rally round and get what's needed to stay up. 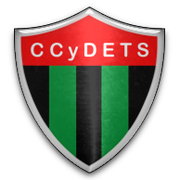 Just the one competitive fixture in June, but boy was it a big one - Cerrito, a relegation rival, on the road. Some odd scheduling meant that was the league's sole match, with four friendlies being scheduled to make up for the break. In sizeable off field news, there's been a big name addition to the squad - one you'll likely recognise. 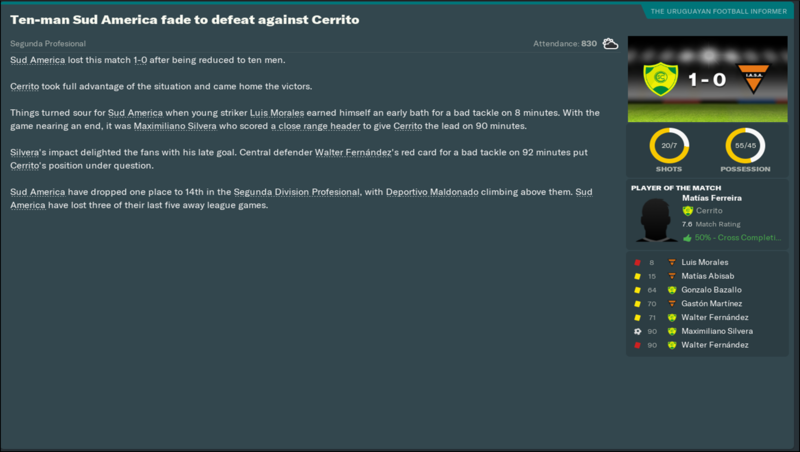 Thoughts: Major disappointment, crippling defeat to Cerrito; we had to win that. 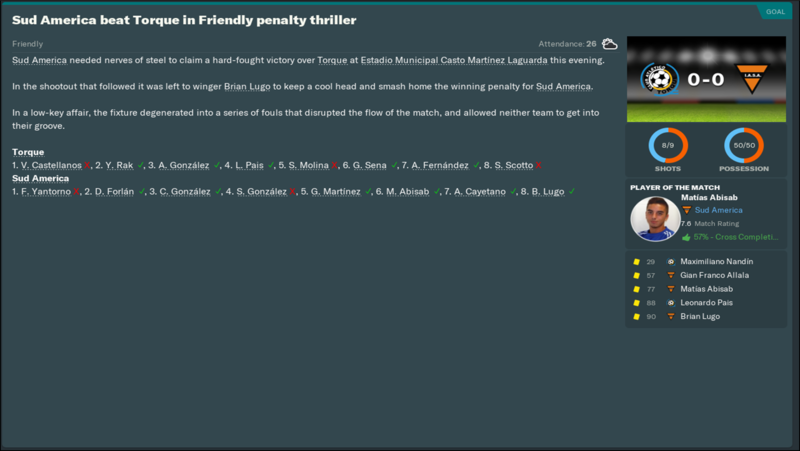 I've reported Luis Morales to the authorities for match-fixing after his eighth-minute straight red card, what an absolute imbecile! 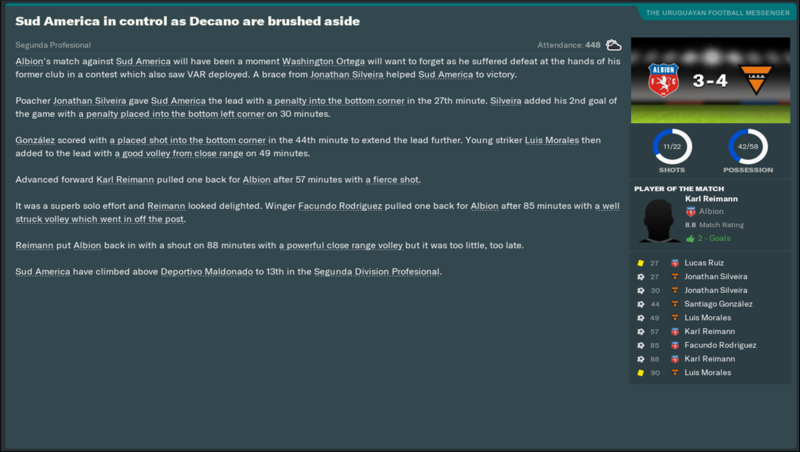 We never recovered from that, Cerrito were bang average but took their chance. 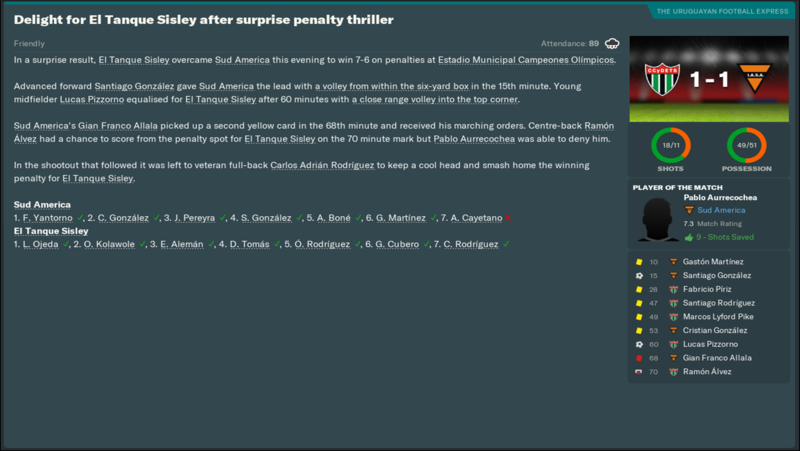 Thoughts: Friendly number one ended in a penalty shoot-out defeat to lower league El Tanque Sisley. 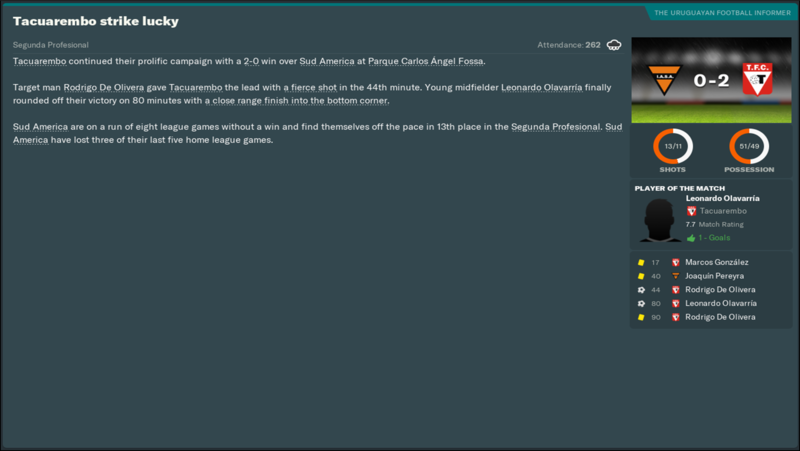 Thoughts: Friendly number two ended in a penalty shoot-out defeat to lower league La Luz. Thoughts: Friendly number three ended in a penalty shoot-out defeat to lower league Canadian. Have you noticed a pattern? 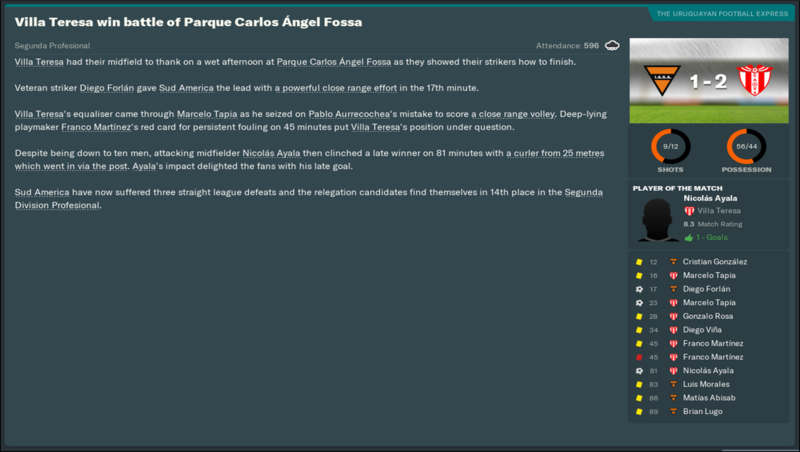 Thoughts: Friendly number four ended in a penalty shoot-out defeat win over lower league Primera División Torque. Recap: Well, that was a lot of fun; thoroughly enjoyed that... 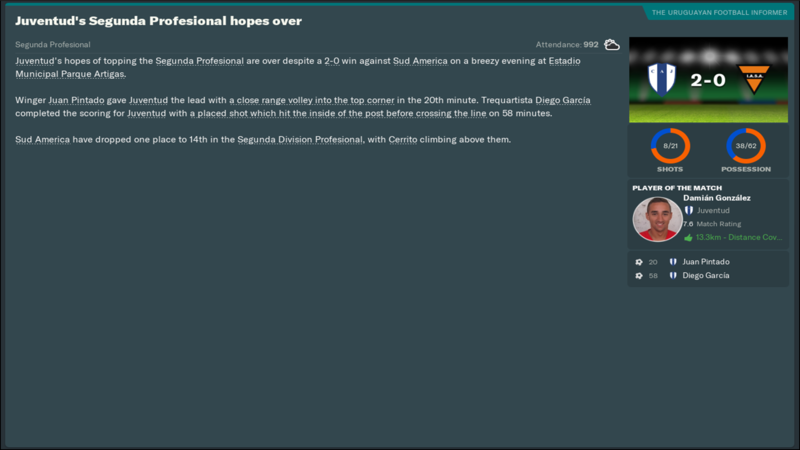 Dreadful month of action, our friendly form was hit hard by that huge Cerrito loss. 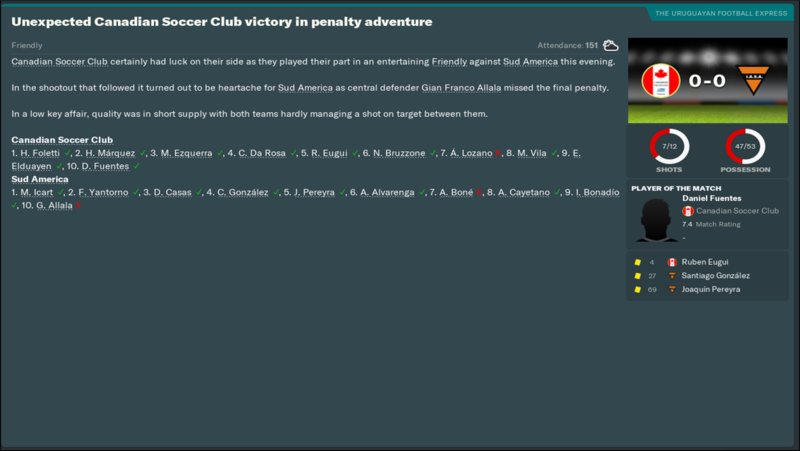 Losing three friendlies all on penalties to lower league opposition, yet then go and beat a top division team in our finale. Bizarre! The fact all our friendlies went to a shoot-out probably shows you how bad we are in front of goal, in defence not quite so bad. 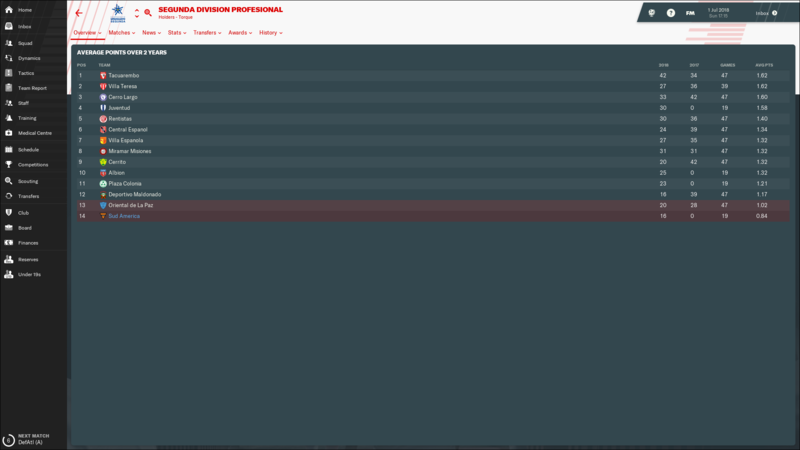 Next month it's more of the similar, three friendlies to go along with just one Segunda División match. Annoying. 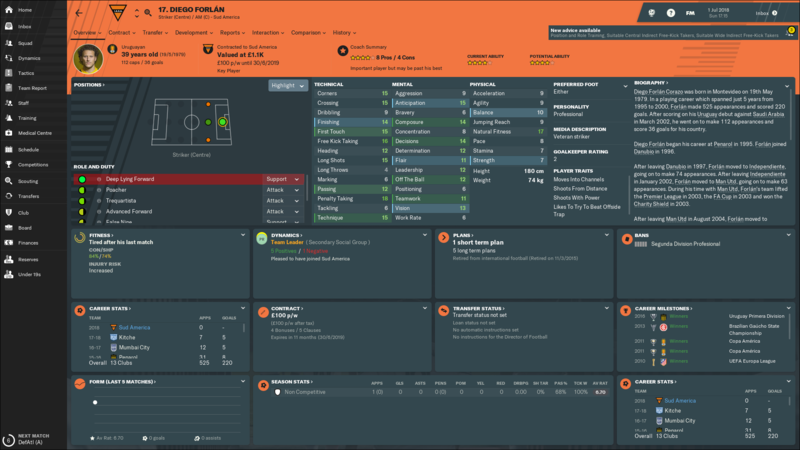 Diego Forlán has arrived. Yes, really. 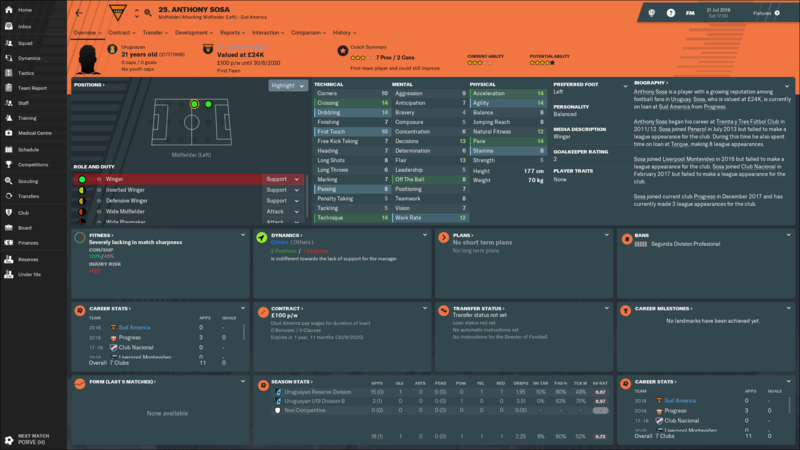 I mean, he may be 39 years old but we got him on a bargain of £100 p/w - madness. Worth a punt, I can guarantee he won't be worse than what we've currently got. What a coup getting Forlan! Hopefully gets you some much needed goals to get those average points up! 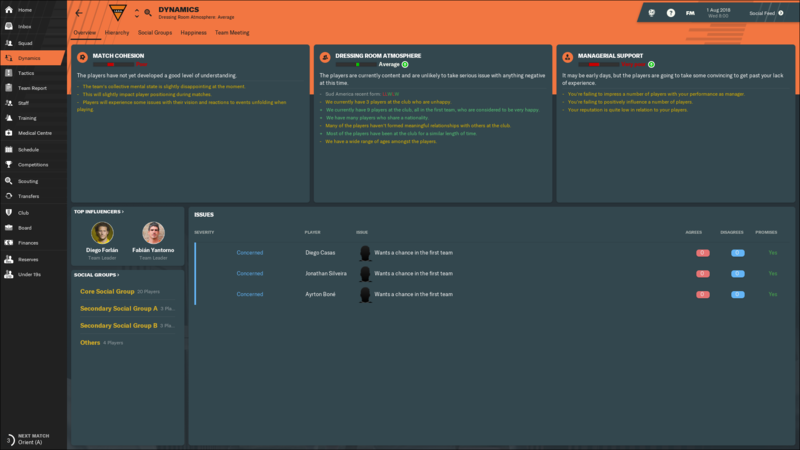 What a weird structure having a league game, then loads of friendlies then another league game then more friendlies, hopefully your squads fitness levels are high though. No idea why he accepted £100 p/w, but glad he did - gives us a slight chance if he can start firing. 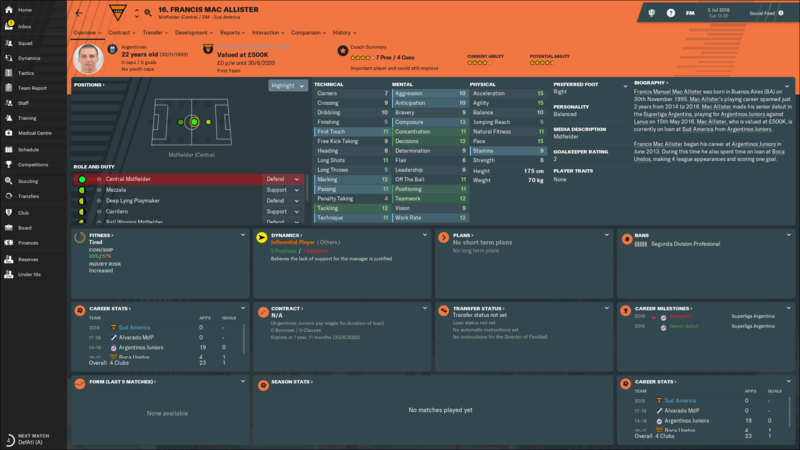 It's definitely a win win for you, even with his bad physicals if he can get into some good positions and use his mental skills to being the right place at the right time I've no doubt he'll turn into an inspired signing! 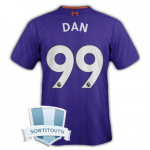 Can't wait to see he gets on for you. Oh my days, Diego Forlan! Let's hope he can bring his scoring record with him! What a player to sign! 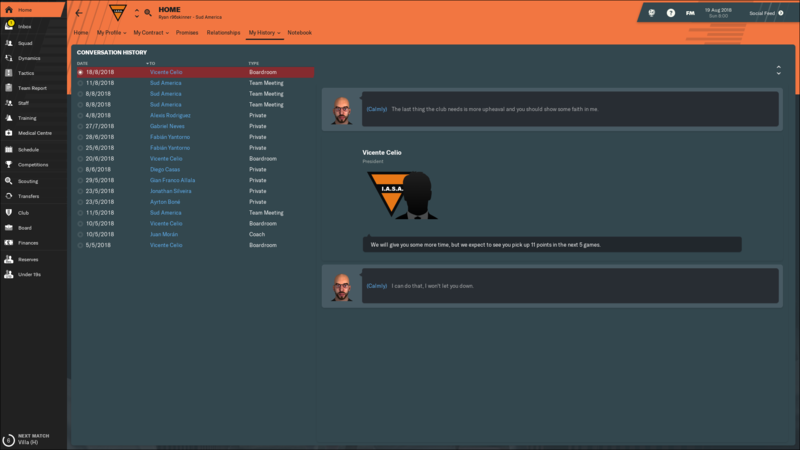 Cool moment, worth the relegation alone Gonna need his goals, for sure! 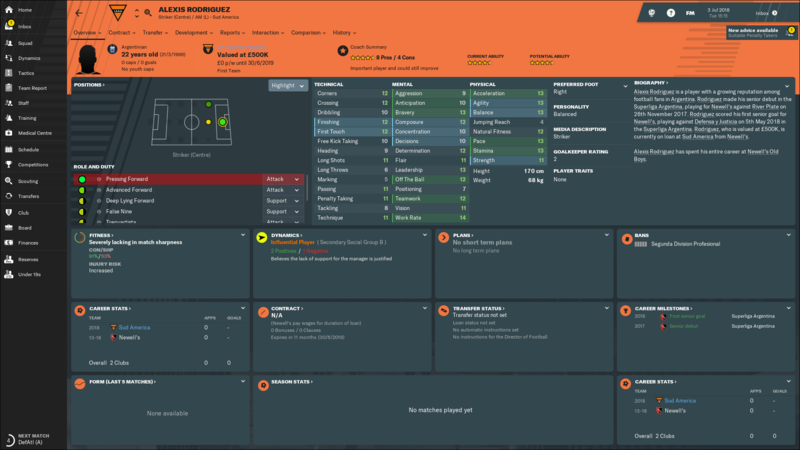 A massive coup in Diego Forlan, hopefully, he'll bring you the much-needed goals that you're lacking and fire you up the table! Desperately needed! I've got faith in the man. The frustrating fixture scheduling is almost over, just one more month filled with friendlies to go before the business end of the Segunda División kicks off. With that said, I was actually OK with this month's set of friendlies as I've made a bunch of new signings to go alongside Diego Forlán's arrival so it was a good moment to allow the players to settle in. 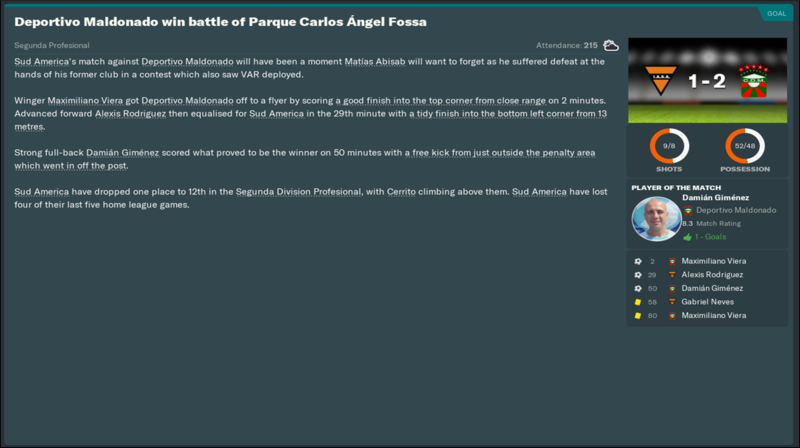 Thoughts: July's first friendly gave Forlán his first goal for the club, with fellow new signing Alexis Rodríguez also scoring. 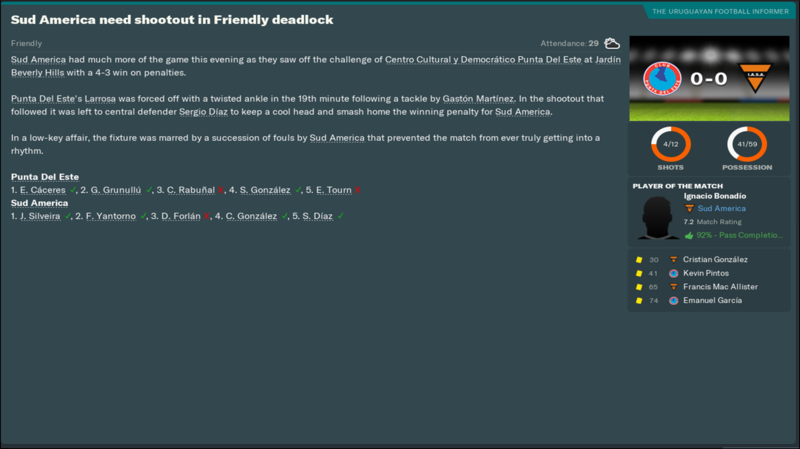 Thoughts: Goalless draw with Punta del Este, a lower league outfit. Disappointing, but a positive performance. 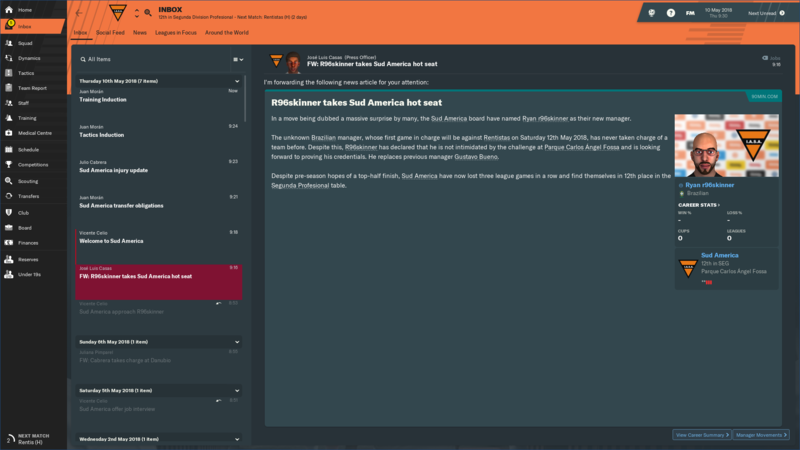 Thoughts: We hosted Argentine opposition in our last friendly, in which we had a shaky start but hit back superbly to win 4-0. New strike partners Forlán and Rodríguez netting a goal each. Good feelings ahead of the league action returning. Thoughts: Diego, Woah! Diego, Woah! 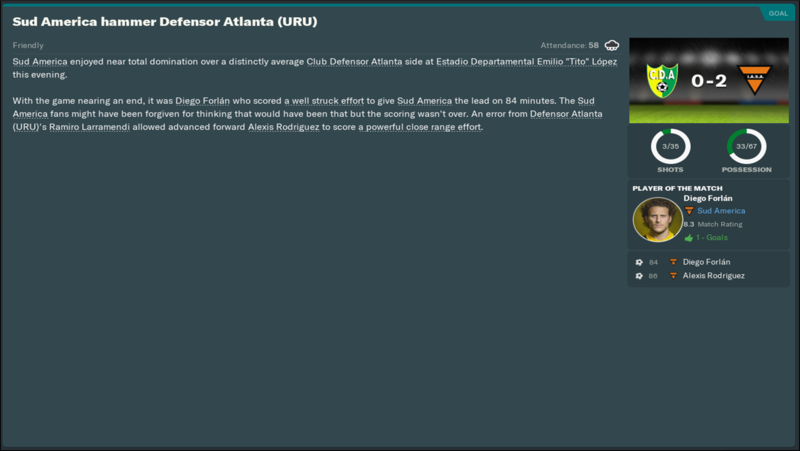 Stunning display on his league debut for Sud América, he notched a brace to send us to victory over the division's sixth place side. That, ladies and gentlemen, is classic Football Manager. Forlán, our biggest hope in avoiding the drop, gets injured in training days after his debut heroics and will be miss the crucial matches with fellow relegation threatened sides Oriental and Deportivo Maldonado. Recap: Massive optimism shut down immediately. Hard to take, but that's the way this game is sometimes - just gotta deal with it. 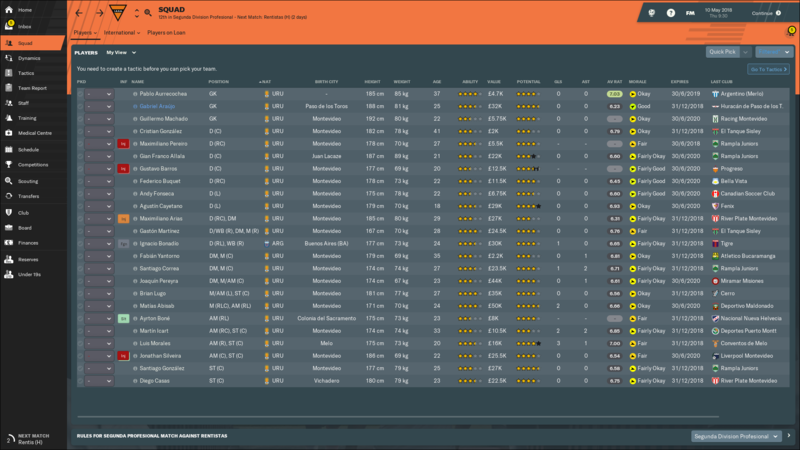 Hopefully my other new signings, who have shown promise themselves, can avoid injuries and fire us in Forlán's absence. Here's hoping! A: While collecting the screenshots for this post, I thought I'd check the board confidence. 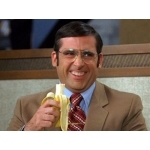 My job status, only after that recent league win, has gone down to "insecure" due to their worries over player support. B: ...here's the subsequent squad dynamics. Their worries are fair, but that hasn't changed since I joined. If anything, as mentioned by the game itself, the squad's mood is improving. 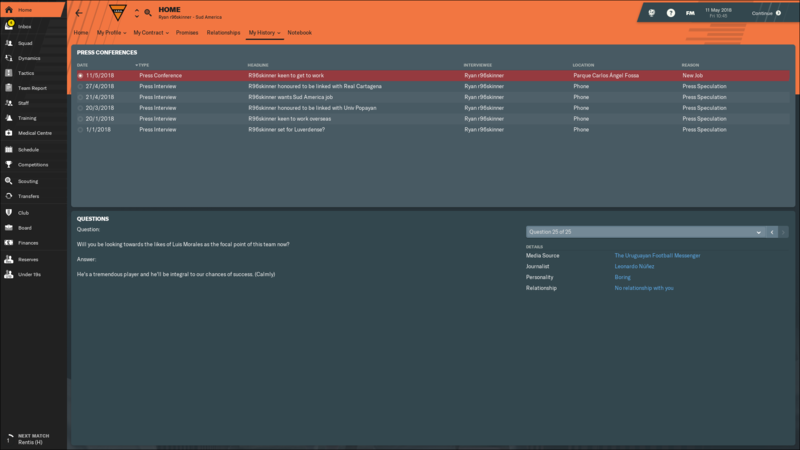 C: Lastly, here is a round-up of my transfer dealings - used the loan market well, I feel. 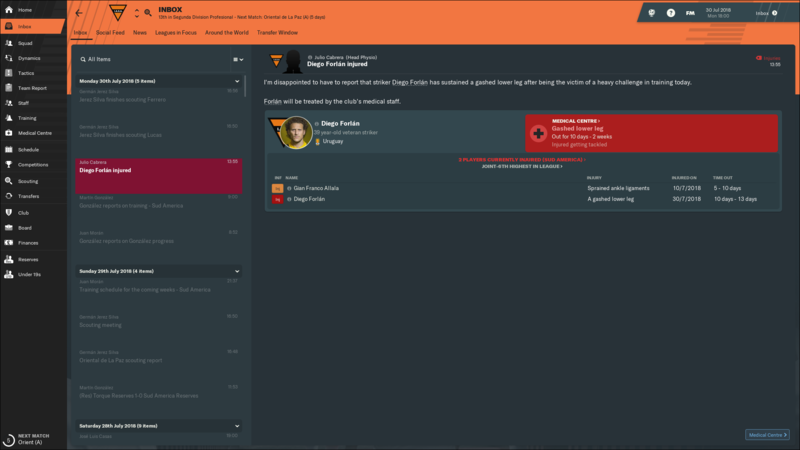 Unlucky with the injury to Forlan, however 3 friendly victories and a much needed win in the league maybe the team are going to rally around in his absence? Hopefully this form continues and you get more points on the board. The blasted dynamics, something I always struggle with in recent FM's! Hoping so, loan signings mean we aren't solely relying on Forlan but will still be a sizeable miss. 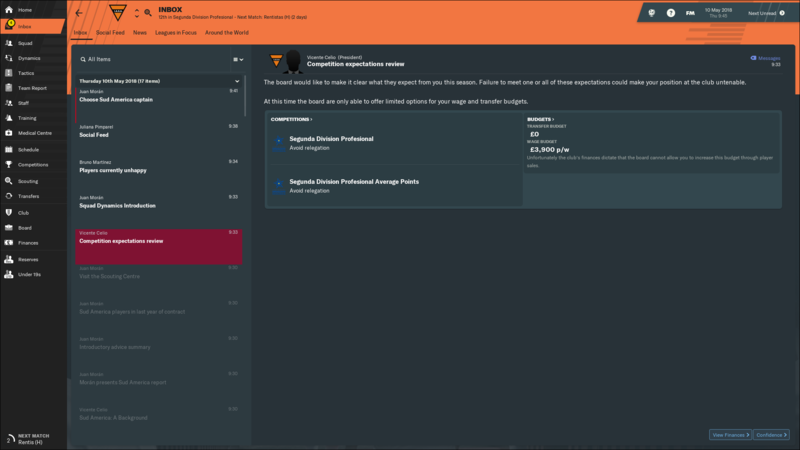 I didn't buy FM18 so this is my first true experience of it, hopefully it won't mess me up! Shame about Forlan' injury so soon after scoring two on his debut too! A good month tho, hopefully that'll up hold now. 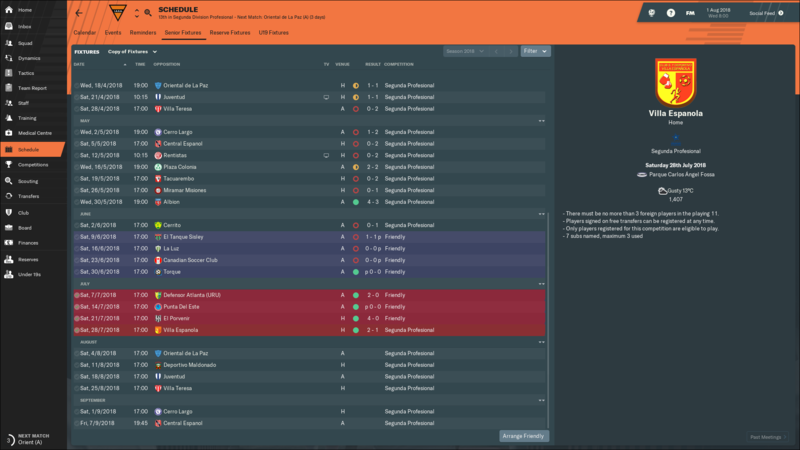 Must do as our next two games are huge, both Oriental and Maldonado are directly above us in the average points table. Nervy times! Time for someone to step up and take the goal scoring load from Forlan in your time of need mate. These next 2 games could make or break your season. It is not running very well there and with the forlan lesion worse. Thoughts: Best possible start! 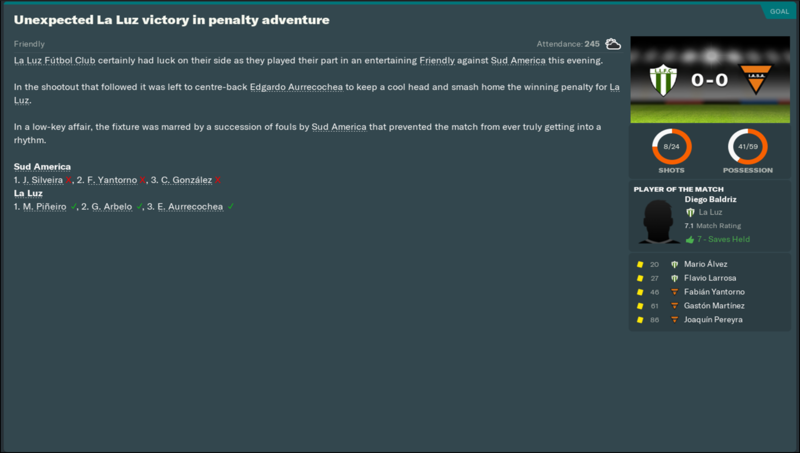 Huge three points over relegation rivals Oriental, Alexis Rodríguez converting two penalties; some fortune for us, at last. Thoughts: Ah. Good work immediately undone, critical defeat to our other competitor in avoiding the drop. Thoughts: Job search all but scheduled, an expected defeat to promotion chasing Juventud despite, as you can see, us dominating them. One of them games. Thoughts: Forlán got his first goal back from injury to put us ahead, but it was meaningless as we subsequently lost all three points; despite facing ten men for forty-five minutes, a red card you genuinely wouldn't have noticed if it didn't show it to you - nothing changed at all. 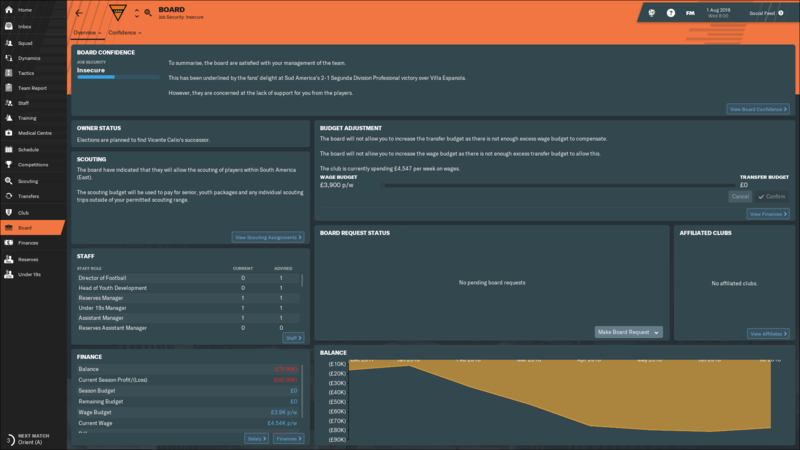 Recap: Relegation is a certainty now. 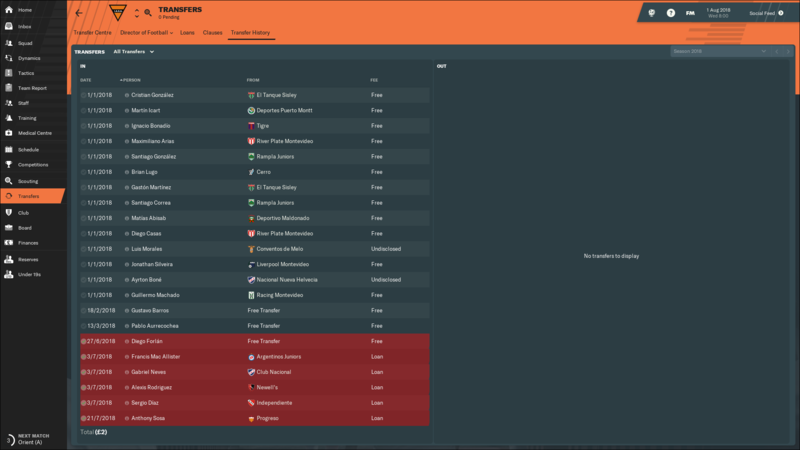 We aren't officially down according to the game but it's all but done with just two fixtures remaining. Off field it has been dreadful too, as shown below. A true miracle is needed if we are to survive. B: While with the board, it was somewhat roles reversed. I mentioned last time about job security, well that actually improved prior to the Oriental match. They, rightly, stayed quiet around the Oriental but have since pipped up in the aforementioned losing run. A board meeting was scheduled, ending with me having to promise 11pts from the next 5 games - that's despite only having two games left. I'm likely to fail their target anyway. C: We've had board elections, with Victoriano Almeida replacing Vicente Celio as president. Almeida immediately states the new board will only judge me from when they took over, which was after the Villa Teresa fixture. Yet, my past promise with the old president is still active according to the game and the board confidence is identical. Gotta love that. 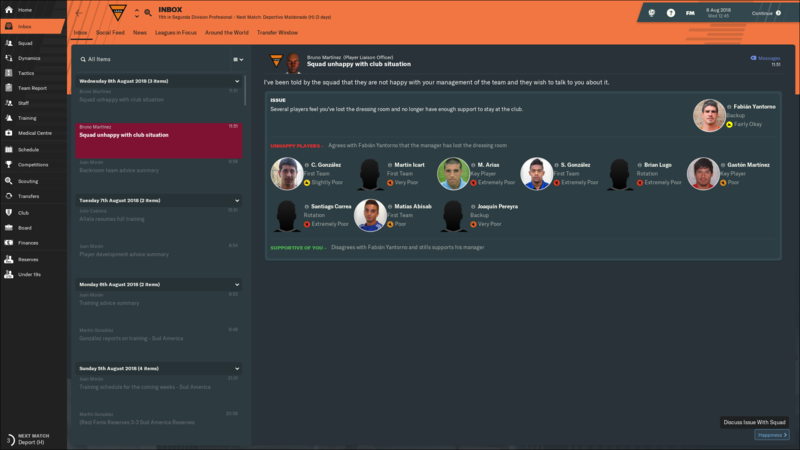 At least he didn't sack me, I guess.